This firmware is intended to upgrade the AQ1000 to the latest version. How to check the current firmware version. After power on, tap the Product Information icon on the top menu to display the current version. Languages (French, German, Polish, Dutch, Turkish, Italian, Russian). The full screen event list. Capability to directly save SOR file and PDF file at the same time. Capability to select SOR files to generate reports. ON / OFF setting to the auto event analysis. Improved the event search performance for an end point by changing the default value of detection threshold. This AQ1000 is specifically designed to increase the productivity of field personnel working on the installation and deployment of optical access networks such as Fiber To The Home (FTTH). 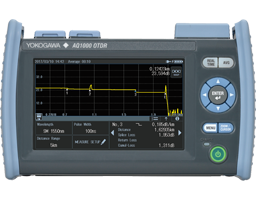 Although it is positioned as an entry-level model, it still retains Yokogawa’s established standards of quality/reliability and features characteristics which are usually present in higher-level models, such as a high-quality capacitive multi-touch touchscreen and wireless connectivity.